Signs mark the entrance to the South Texas Family Residential Center in Dilley, Texas. UPDATE, Aug. 7, 2018: This story has been updated with new details from attorneys representing the mother of a child who died following release from a Texas immigrant detention center. 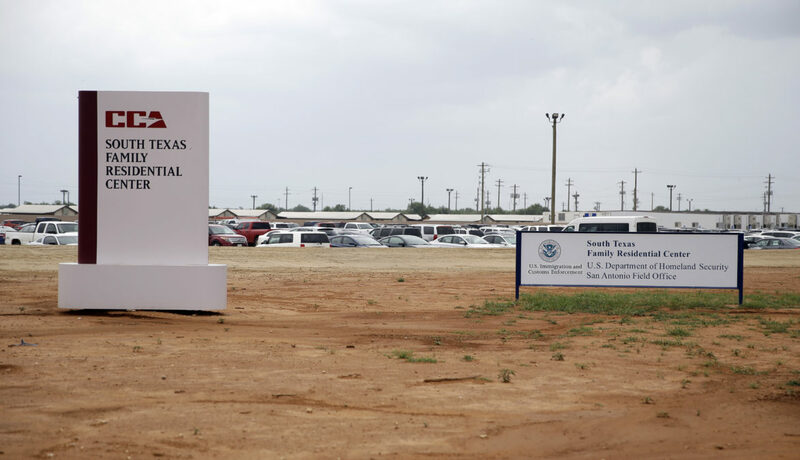 A child who died after being released from a South Texas family detention center “tragically died after being detained by ICE in unsanitary conditions,” a law firm said Aug. 7. Several attorneys from the firm, Arnold & Porter, are representing the child’s mother pro bono. “We currently are assessing the case and have no further comments at this time,” Arnold & Porter spokeswoman Issara Baumann told Reveal from The Center for Investigative Reporting. U.S. Immigration and Customs Enforcement said in an email to Reveal that the agency “could look into this case” if more details were shared. As of Aug. 7, the mother and her new attorneys have not released the child’s name or age. Reveal previously reported that the child died following release from the South Texas Family Residential Center in Dilley. News of the death went viral on Twitter on July 31, when Houston immigration lawyer Mana Yegani posted that the child died “as a result of possible negligent care and a respiratory illness she contracted from one of the other children.” A lawyer who knows the family was helping them find an attorney, Yegani wrote. In a phone interview, attorney Melissa L. Turcios confirmed that she knows this family and that the child died after being released from the South Texas Family Residential Center in Dilley. She declined to provide further details because she is not the lawyer for the case. “I can’t comment at this stage. It’s very early,” said Turcios, an associate for Wilkinson Barker Knauer LLP in Washington. Yegani initially tweeted that the child died while in ICE custody. She later clarified that the child died following release. Medical professionals have expressed concern about the risk of children, particularly those who traveled under difficult conditions, contracting diseases at immigration detention facilities. Dr. Peter Hotez, dean of the National School of Tropical Medicine and a Baylor College of Medicine professor of pediatrics and molecular virology and microbiology, previously told Reveal that the biggest concerns are viral respiratory diseases, noroviruses and enteroviruses, which lead to meningitis. Hotez compared the situation with evacuation shelters after hurricanes or other disasters, where infections spread quickly and access to care is limited. At the detention center in Dilley, families typically are held for a few weeks as they wait for a credible fear interview to prove their asylum claims. This is not the first time the South Texas facility has come under scrutiny for its medical care. Last year, several organizations, including the American Immigration Council, Women’s Refugee Commission and American Civil Liberties Union, claimed in a complaint that ICE had been violating its own policy by locking up pregnant women in at least five detention centers, including the one in Dilley. Laura Morel can be reached at lmorel@revealnews.org. Follow her on Twitter: @lauracmorel.